Known since 2800 BC, by the doctors at that time believed to have medical values ​​that can restore a sense of calm and peace. 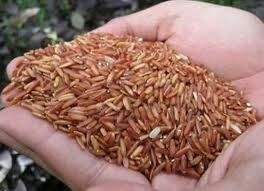 Flour 'red rice broken skin' to prevent various diseases such as colon cancer, kidney stones, beri-beri, insomnia, constipation, hemorrhoids, blood sugar, and cholesterol. The content of carbohydrates in brown rice are lower than white rice but the results of the analysis Nio (1992) showed the value of energy produced red rice is actually higher than white rice. Has a higher protein content. It has a high content of thiamine. Thiamine deficiency can disrupt the nervous system and heart, in severe circumstances called beri-beri, with initial symptoms of decreased appetite, indigestion, constipation, fatigue, tingling, palpitations, and diminished reflexes. Phosphorus contained in brown rice is important for bone health and avoid the threat of osteoporosis (bone loss), which targets women. Contains selenium which include trace elements (trace element) and is an important part of the enzyme glutathione peroxidase is potentially able to prevent cancer and other degenerative diseases. Contains lots of fiber, which can help us streamline the body.